Meniscus Tear: Does It Require Surgery? Does a meniscus tear require surgery? A panel recommends against arthroscopy for “nearly all” patients with meniscal tears as well as knee osteoarthritis. The meniscus is the horizontal “cushion,” or cartilage pad, between the upper bone (femur) and lower bone (tibia). The one on the inner side of the knee is the medial meniscus. The lateral meniscus is on the outer side of the knee. A meniscus tear, one of the most common knee injuries, can be the result of osteoarthritis-related degeneration, an injury caused by twisting or a sudden stop, or a blow to the knee. The risk increases with age, being overweight, or both. The meniscus is a crescent-shaped cartilage pad between the femur (the bone in the upper leg) and the tibia (a long bone in the lower leg). There are two menisci: one on the inside of the knee (the medial meniscus) and the other on the outside (lateral meniscus). They improve the fit between the two bones, act as a shock absorber, move lubricating fluid around the knee, and distribute the body’s load on the knee joint. Symptoms of a meniscus tear usually begin with pain and swelling. The pain can be on the inner or outer side of the knee, not around the kneecap itself. Swelling often does not occur until the day after an injury, and swelling is not necessarily in the same area as the pain. A meniscus tear may also cause a popping sound, especially when going up or down stairs. A possible source of the sound is a piece of loose cartilage that gets caught as the knee joint moves. 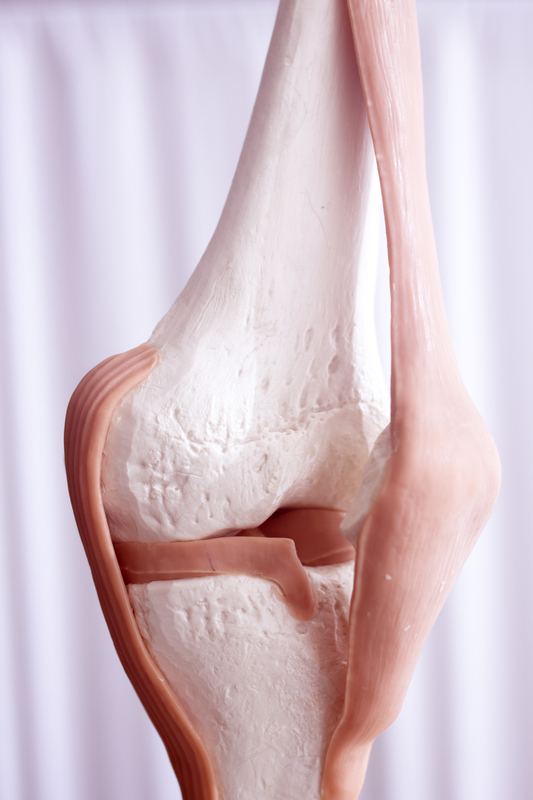 A torn meniscus can cause catching or locking of the knee. The knee gets stuck in midrange for days at a time, and on occasion the patient can “unlock” the knee by gently bending or twisting it before trying to straighten it. Some people with a torn meniscus can function more or less normally. Others find that it prevents them from participating comfortably in their normal daily activities. Some patients may feel that the knee is unstable; it may even buckle. To determine the precise nature of the injury, a doctor gets your medical history, performs a physical exam, and uses X-rays and/or magnetic resonance imaging (MRI). Self-management of a torn meniscus begins with over-the-counter medications, (ibuprofen, acetaminophen), rest, ice, compression, and elevation. Knee strengthening exercises for the quadriceps and hamstrings can help a person return to normal function following an injury and perhaps prevent another tear. Examples: straight leg raises, wall squats, passive knee extension, heel raises, and step-ups. Check with a physician or physical therapist before beginning a new exercise program. Surgery is an option, with as many as 750,000 procedures performed each year in the U.S. But recent research is not as supportive of meniscus surgery as it once was. It is a minimally invasive arthroscopic procedure in which the meniscus is repaired or removed. In a May 2017 issue of BMJ, a panel of physical therapists, orthopaedic surgeons, other physicians, and patients conducted a review of meniscus-related studies. They concluded that arthroscopy—minimally invasive surgery—should not be performed on the vast majority of patients with degenerative knee disease, including those with a meniscus tear. Degenerative knee disease was defined as knee pain not caused by traumatic injury in patients over age 35, with or without imaging evidence of osteoarthritis, meniscal tears, or mechanical symptoms. Outcomes for knee arthroscopy were no better than exercise in people with degenerative meniscus tears. The panel added that further research would be unlikely to alter their recommendations. In 2016, BMJ reported on a study conducted in Norway and Denmark in which 140 meniscus tear patents drew lots for treatment with either exercise or surgery. After two years, both groups had fewer symptoms and better knee function, and there were no significant differences between the two groups in terms of outcomes. Recovery time following a torn knee meniscus depends on the treatment—a month or so if conservative treatment works vs. up to three months if surgery is performed. Although arthroscopically treating a torn meniscus may eliminate mechanical symptoms such as catching or locking, the symptoms of accompanying osteoarthritis—stiffness, achiness, pain—may persist. When that happens, the remaining options are 1) injections of corticosteroids or lubricating substances, and 2) partial or total knee replacement. Injections are a temporary fix that have to be repeated periodically. Knee replacement is an effective but last-resort approach that might be recommended for severe knee osteoarthritis, not simply a torn meniscus. bone, cartilage, corticosteroids, exercise, exercise program, joint pain, knee arthroscopy, knee joint, knee joint pain, knee osteoarthritis, knee pain, knee replacement, meniscus tear, osteoarthritis, pain, recovery, total knee replacement. I recently bought a vibration platform. Go on it 10 minutes a day. It’s helping my flexibility and balance. What comments do you have on this? I I disagree with this entirely. I just had surgery for a torn meniscus. I am a regular exerciser. The pain I had was unbearable. After the surgery along with physical therapy of 4 sessions I am at 75%. Denise, I agree with your direction for improvement. The vibration panel will increase blood flow and accelerate healing along with stretch and exercise. What brand did you choose??? Anthony, I as you had terrible pain due to a torn meniscus and quickly choose surgery which now I regret. Proper exercise, care, and patience would have been a better choice for me. I now am in the process of scheduling a knee replacement because too much was removed during and it allowed arthritis to set in. Nine years dealing with this and tried the syn-vex, 3 shot deal a few times. I believe your use of lateral and medial is reversed. You say lateral is on the inside and medial is on the outside. Elsewhere (and doctors offices) it says lateral is on the outside and medial is on the inside. In other words, your left & right medial meniscus would be adjacent to each other. Disagree. Had partial removal in 2012 as a 45yr active female. Pain was unbearable. Originating from old soccer injury, exacerbated by biomechanics. Best thing I ever did for the pain! Had both lateral and medial tears repaired surgically, slowly increasing walking distance. Physical therapy success in that within 4% if perfect bend; stiff am/pm doing the simple exercises keeps the knee straight so as to keep all aligned. Occasional ache, no pain. Have had two ACL replacements on same leg, now have Osteoporosis. Recently tore my meniscus on same knee. Last thing I will do is surgery, specialists advised I would get Osteoporosis from surgery they were correct. I do recommend supplements to replace the natural substances that your body slows producing after 25. I thought you might be interested in this article on https://universityhealthnews.com: Meniscus Tear: Does It Require Surgery?